1. Preheat the oven to gas 6, 200°C, 180°C fan. 2. In a large, roasting tin toss the butternut squash with 1 tbsp of the olive oil, and bake in the oven for 45 minutes until cooked through. 3. Bring a large pan of salted water to a boil and cook the macaroni according to the packet instructions. When it is cooked, drain and set aside. 4. Heat the olive oil and butter in a large frying pan, and add the onion. Cook on a low until the onion is soft, then add the flour and mix well. Take the pan off the heat and gradually pour in the milk, stirring constantly to ensure the sauce is smooth. 5. When all the liquid is added, return to the heat, stir in the mustard and bring to the boil. Boil for 2 minutes, stirring occasionally until the sauce has thickened to custard consistency. Now add 1/2 tsp salt and a pinch of ground black pepper and stir in. 6. Remove the butternut squash from the oven and whizz in a food processor until smooth. Add it to the white sauce with the Cheddar and mix well until the cheese has melted. 7. Now add the cooked pasta and mix everything together. 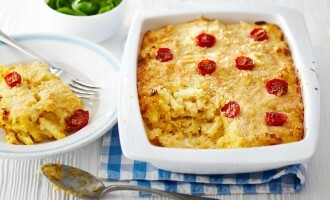 Pour into a large roasting dish and top with the Cheddar, breadcrumbs and tomatoes. Bake in the oven for 20 minutes until bubbling and golden. Serve immediately.